Creating a “unique” or differentiated product is every company’s goal. But, how does the company sustain its product’s uniqueness? While sustainability is popular, it remains an elusive goal for entrepreneurs of unique products. It is elusive because the concept of sustainability is difficult to market to those who are resistant to change, who question the need for sustainability concepts, or who are reluctant to purchase differentiated products. Can marketing analytics help? 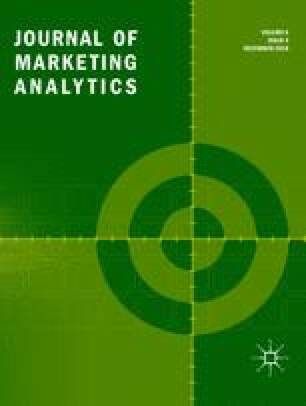 This paper presents a case study of where analytics did support an effort to market a product that was considered unique and difficult to sustain without analytics in a competitive market. The case is Domino’s AnyWare™. Allen, Nathan. 2018. 4 Key Trends Happening Now In Biz Ed. https://poetsandquantsforundergrads.com/2018/01/10/four-important-trends-happening-now-business-education/. Poets and Quants for Undergrads, January 10. Retrieved May 2018. Brown, Philip. 2013. How to Create a Unique Product. https://www.culttt.com/2013/05/29/how-to-create-a-unique-product/. Cultt. Retrieved May 2018. CMO Survey. 2017. Marketers to Spend on Analytics; Use Remains Elusive. https://cmosurvey.org/2017/02/cmo-survey-marketers-to-spend-on-analytics-use-remains-elusive/. February 28. Retrieved March 2018. Forbes. 2016. Big Data-Driven Decision-Making at Domino’s Pizza. https://www.forbes.com/sites/bernardmarr/2016/04/06/big-data-driven-decision-making-at-dominos-pizza/#5c5ead442b8e. Retrieved March 2018. Grace Communications Foundation. 2017. The Meat to Eat. http://www.sustainabletable.org/1649/the-meat-to-eat. Retrieved May 2018. Judkis, Maura. 2017. The days of ‘Whole Paycheck’ are over. Here’s how the Amazon-Whole Foods deal affects you. https://www.washingtonpost.com/news/food/wp/2017/08/24/the-amazon-whole-foods-deal-closes-monday-are-the-days-of-whole-paycheck-over/?utm_term=.105bf8861f09. The Washington Post, August 24. Retrieved May 2018. Kowitt, Beth. 2017. Can Amazon Finally Kill Whole Foods’ ‘Whole Paycheck’ Reputation? http://fortune.com/2017/08/24/amazon-whole-foods-lowering-prices/. Fortune, August 24. Retrieved May 2018. Organic Trade Association. 2017. Robust Organic Sector Stays on Upward Climb, Posts New Records in U.S. Sales. www.ota.com/news/press-releases/19681. Retrieved May 2018. Reuters. 2017. What Industry Analysts and Insiders Are Saying About Amazon Buying Whole Foods. http://fortune.com/2017/06/16/amazon-buying-whole-foods-analysts/. Fortune, June 16. Retrieved May 2018. Uberoi, Ravneet. 2017. Zara: Achieving the “Fast” in Fast Fashion through Analytics. https://digit.hbs.org/submission/zara-achieving-the-fast-in-fast-fashion-through-analytics/. Harvard Business School. Digital Innovation and Transformation. Retrieved May 2018. U.S. Department of Agriculture. 2017. Organic Market Overview. https://www.ers.usda.gov/topics/natural-resources-environment/organic-agriculture/organic-market-overview.aspx. Retrieved May 2018. Weed, Keith. 2017. Report shows a third of consumers prefer sustainable brands. https://www.unilever.com/news/Press-releases/2017/report-shows-a-third-of-consumers-prefer-sustainable-brands.html. Unilever. Retrieved March 2017.